We invite you to explore India - the Land with infinite beauty ! Whether you soar high into Himalayas or peer under the ruins of the Ancient monuments dotting the landscape of India, you will cherish the experience long after your visit ! This India Travel Guide on Sakshi Gopal Temple Puri is free from any commercial interest! This site is dedicated to promote India - the vast subcontinent, its glorious past, magnificent landscape and its infinite variety. Sakshi Gopal or Satyabadis as the Lord is known is a temple built in the 19th century for Lord Krishna. The temple is located in a town Sakshi Gopal at Satyabadi near Puri. God who accepted to stand witness for his ardent devotee, Sakshi Gopal literally means Gopal or Lord Krishna who came as Sakshi, i.e. witness. Sthala Puranam: The temple legend lists out that two Brahmins one old and rich, the other young and poor from Vidyanagar in the South of India went on a pilgrimage to Brindavan. The older Brahmin fell sick and the younger Brahmin took very good care of him. After his recovery, the older Brahmin promised to get his daughter married to the younger Brahmin. The young Brahmin had his own fears and expressed them to the older Brahmin. However the older Brahmin assured him of marriage with his daughter. After reaching their village when the young Brahmin approached the older Brahmin for his daughter’s hand, he refused and evaded the young Brahmin. The young Brahmin immediately left for Brindavan and requested the Lord to accompany him as witness. The Lord agreed however asked the young Brahmin to lead the way and not to turn back and look for the Lord while walking. As agreed they traveled a great distance and as they reached the outskirts of the village, the young Brahmin turned back to check for the Lord as he couldn't hear the footsteps of the Lord. As warned by the Lord earlier, he stood rooted there and turned into a statue. The villagers ensured that the wedding of the couple took place and built a temple for Sakshi Gopal, the Witness Lord. The then King of Orissa, Sri Purushotam Dev conquered Vidyanagar and took the statue of Sakshi Gopal to Cuttack along with him. He worshipped the Lord there until the Muslims invaded the place. During that time the Lord was shifted to Alasa and a brahmachari raised huge donations to build a huge temple for the Lord. Now the temple is run by the Government of Orissa. As the story goes a young man from the village fell in love with the daughter of the village head man. The village headman was not in favor of the young man marrying his daughter as he was poor. All the villagers including the poor young man and the rich head man set off on a pilgrimage to Kashi. Fatefully, the village head man fell sick in Kashi and none of the fellow villagers bothered to take care of him. However the young man took care of the head man so well that he recovered from the illness completely and as a token of gratitude offered to marry his daughter off to the young man. The head man asked the young man to bring along a witness for the wedding and the young man having no one, requested Lord Gopal to accompany as witness. The Lord obliged and instructed the young man to lead the way and also asked him not to turn back and look while walking. En route they reached a sand mound and the young man on not hearing the foot step of the Lord turned back to see if the Lord was there. The Lord stood rooted there and turned into a statue. The villagers were moved by the devotion of the young man and decided to get the lovers married. They built a temple for the Lord in the same place. The Lord came to be called Sakshi Gopal, the Lord who came as witness and the couple was nominated as the first priests of the temple. The Lord of this temple holds a flute in his hand and Radha, his consort is seen standing by his left side. 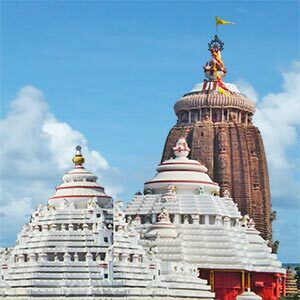 This temple is said to be a miniature of the Puri Jagannath temple. The temple is built in the Kalinga style of architecture. Amla navami is a popular festival celebrated annually. Amla means gooseberry and navami is the ninth day in a lunar cycle. The festival marks the practice of touching the feet of Radha, Lord Krishna’s consort. The temple is situated in a village and is neat and well kept. You can visit the temple around 4 pm to see the Arthi. Beware of extortion from the pandas or purohits who would insist on offering their services and charging exorbitant amounts of money.